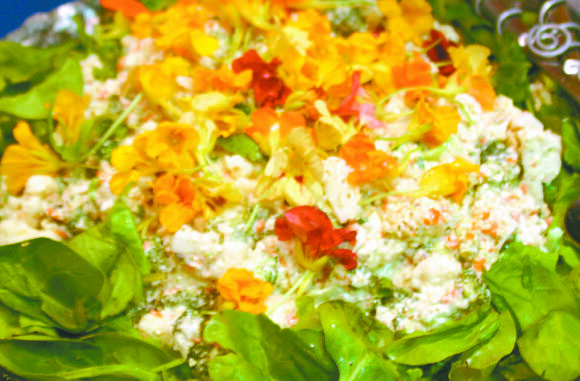 Teacher Appreciation Salad - we’ve got the SECRET RECIPE! HomeRecipesTeacher Appreciation Salad – we’ve got the SECRET RECIPE! A delicious veggie salad was served at the A. A. Songy Teacher Appreciation luncheon at the school in Luling by Amy Brezinsky, secretary, and Leslie Cambre, treasurer, of the Songy PTA. Here how’s to make it yourself at home, complete with dressing and garnish of Nasturtium flowers. 5. Boil eggs by placing them in a pot of water; bringing water to a boil, covering, turning off heat and letting sit for 20 minutes. 6. Place olive salad in a food processor and chop more finely. 11. Combine above ingredients in a salad bowl. 13. Refrigerate and let sit about 8 hours. Note: the flowers have different tastes according to the colors.